Buy 3 or more Guides for Association Practitioners (GAPs) and save 20% off the member or non-member price! The discount will display at checkout. This Guide for Association Practitioners covers it all—drafting specifications, performance criteria, warranties and guarantees, maintenance schedules, insurance requirements, and how to communicate with residents. Also includes advice on bidding the contract, selecting the best bid, legal review, environmental concerns, contractor performance evaluation, and provides useful sample specifications and warranties. Well maintained common areas, attractive landscaping, and a pleasant overall environment are essential to the quality of life in any community. Curb appeal is a key component in the desirability of a neighborhood and the value of its individual homes. Maintaining common areas is one of the most basic community association responsibilities, and there are significant advantages to contracting with professionals for these services. 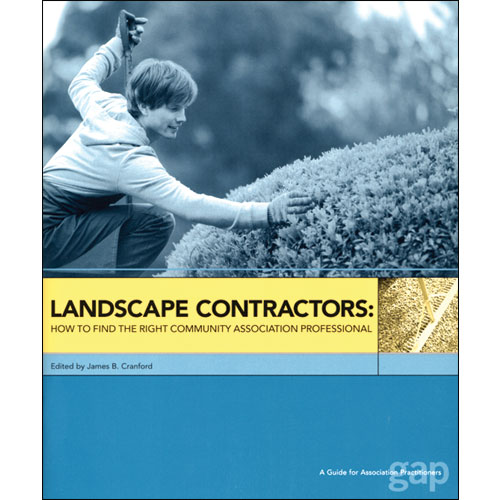 Finding the right landscaping contractor and working successfully with that contractor are very important to the association's success. Developing a clear, comprehensive landscaping contract is the first step. Contracts should include maintenance specifications and schedules and require contractors to be environmentally responsible and properly insured. These and other considerations will contribute to a successful working relationship between the association and the contractor. The contract also provides a specific guide for prospective contractors when developing their proposals as well as a tool for associations to evaluate each potential company according to the same criteria. Associations need to communicate with residents and owners about the value of investing in common area maintenance and keep them informed of the landscape contractor's activities. The right landscape contractor will have relevant experience, good references, well kept facilities, and be a responsible and viable business. Associations should get bids from and meet with several potential contractors before making a final selection. Once the contractor begins working with the association, the board or manager should monitor performance and ensure compliance with the contract. The landscape maintenance budget is a major expense in association management, and associations may need to educate homeowners about the need and indirect value of this expense. By properly contracting for landscape maintenance and services, an association can save money and extend the life of planted goods. Numerous resources are available for associations that need help developing drafting landscape contract specifications. When selecting a contractor, the association should consider the quality of the contractor's personnel. Satisfactory performance requires a well-supervised, competent staff. When deciding on a contractor, insist on current references. Contact each reference and tour the grounds in person. Contractors must be properly insured and environmentally responsible. Realistic specifications and maintenance schedules are critical to a contractor's successful performance. All quotes should be based on one set of specifications. Additional proposals should be considered if they are submitted as an addendum to the specifications. Before signing a contract with a landscape contractor, associations should have the document reviewed by an attorney. Associations should monitor a contractor's performance throughout the term of the contract and work with contractors to remedy problems. © CAI Press, a Division of Community Associations Institute. All rights reserved.